The universe. It's the only home we've ever known. Thanks to its intrinsic physical laws, the known constants of nature, and the heavy-metal-spewing fireballs known as supernovae we are little tiny beings held fast to a spinning ball of rock in a distant corner of space and time. Doesn't it seem a little rude not to know much about the universe itself? For instance, if we could look at it from outside, what would we see? A vast blackness? A sea of bubbles? Snow globe? Rat maze? A marble in the hands of a larger-dimensional aliens or some other prog rock album cover? As it turns out, the answer is both simpler and weirder than all those options. The shape of the universe is a question we love to guess at as a species and make up all kinds of nonsense. Hindu texts describe the universe as a cosmic egg, the Jains believed it was human-shaped. The Greek Stoics saw the universe as a single island floating in an otherwise infinite void, while Aristotle believed it was made up of a finite series of concentric spheres, or perhaps it's simply "turtles all the way down". Thanks to the mathematical genius of Einstein, cosmologists can actually test out the validity of various models that describe the universe's shape, turtles, mazes, and otherwise. There are three main flavors that scientists consider: positively curved, negatively curved, and flat. We know it exists in at least four dimensions, so any of the shapes we are about to describe are bordering on Lovecraftian madness geometry, so fire up your madness abacus. Ya! Ya! Cthulhu ftagen. A positively curved universe would look somewhat like a four-dimensional sphere. This type of universe would be finite in space, but with no discernible edge. In fact, two distant particles travelling in two straight lines would actually intersect before ending up back where they started. This type of universe, conveniently easy to imagine in three dimensions, would only arise if the cosmos contained a certain, large amount of energy. To be positively curved, or closed, the universe would first have to stop expanding – something that would only happen if the cosmos housed enough energy to give gravity the leading edge. 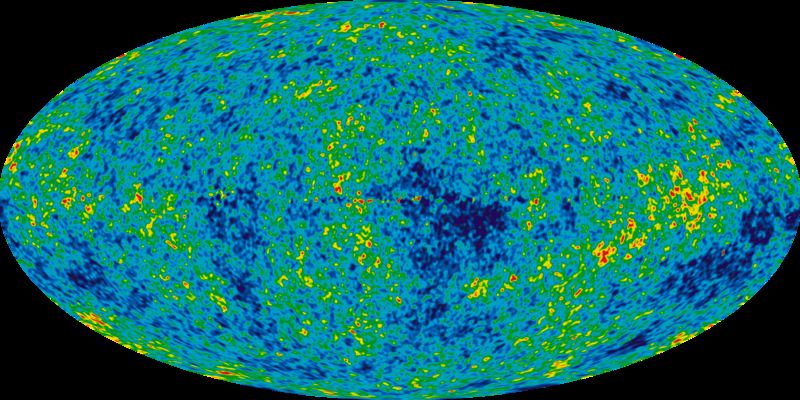 Present cosmological observations suggest that the universe should expand forever. So, for now, we're tossing out the easy to imagine scenario. 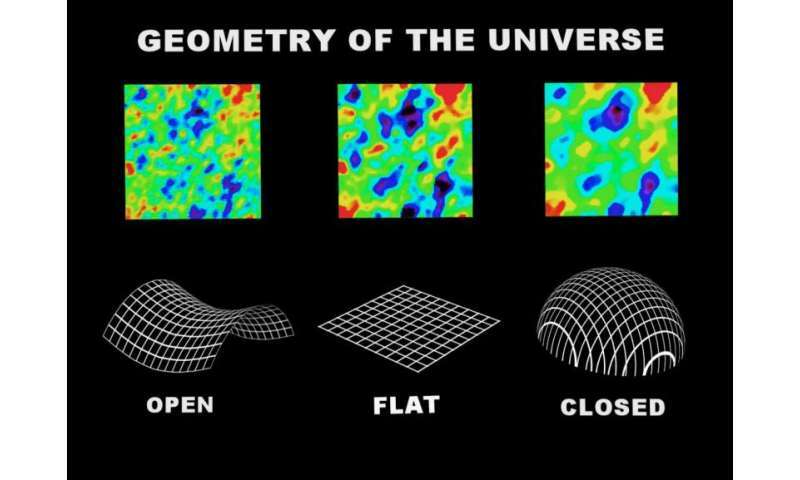 A negatively curved universe would look like a four-dimensional saddle. Open, without boundaries in space or time. It would contain too little energy to ever stop expanding. Lastly, we come to the trumpet. This is another way to visualize a negatively curved cosmos: like a saddle curled into a long tube, with one very flared end and one very narrow end. Someone in the narrow end would find their cosmos to be so cramped, it only had two dimensions. Meanwhile, someone else in the flared end could only travel so far before they found themselves inexplicably turned around and flying the other way. So which is it? Is our universe an orange or a bagel? Is it Pringles? A cheese slice? Brass or woodwind? Scientists have not yet ruled out the more wacky, negatively curved suggestions, such as the saddle or the trumpet. I know this gets a little confusing, and meanders right up to the border of nap time, but here's what I'm hoping you'll take away from all this. It's amazing that not only can we make guesses at what our incredible universe looks like, but that there's clever people working tirelessly to help us figure that out. It's one of the things that makes me happiest about talking every week about space and astronomy. I just can't wait to see what's next. Our Patreon community is the reason these shows happen. We'd like to thank Fred Manzella, Todd Sanders, and the rest of the members who support us in making great space and astronomy content. Members get advance access to episodes, extras, contests, and other shenanigans with Jay, myself and the rest of the team. richardwenzel: recall too that the other possibility, a negatively curved surface with very low magnitude of curvature, also exists. One can turn the same question on its head of course... why so close, but not precisely zero? What cosmic coincidence would create that situation? Simply saying the odds are low for one configuration or the other isn't a terribly great argument given the data we now have. Perhaps, in the future, we'll know something more about the nature of dark energy or dark matter that lends us a strong argument for the "precisely zero" curvature. Perhaps in the distribution of energy to the various fields of the universe, it had to be done in such a way as to balance out. My money, however, is on an open and negatively curved universe which just happens to be presently passing through an eon of relative flatness. Flat eh, where have I heard that before? It seems, though, that the flat universe requires such a critical balance, that a minute, random, quantum energy fluctuation would quickly tip it into one of the alternative configurations. Reading the paper, I think it is in bad shape locally. The volume of the cosmos is that of a doughnut. The matter in it, travels in a circular helix. Just who are these "haters" you refer too? Could it be those who hold religious views? While I am a non-believer myself, I consider such remarks as hate speech and little short of intolerance. You should find a better group of "friends". "Haters are going to argue that we will never know what the true shape of our universe is.Those people are no fun, and are just obstructionists"
.....he's saying the "haters" are those who believe we can't know the true shape of the U. "Based on the most recent Planck data, released in February 2015, our universe is most likely… flat. Infinitely finite, not curved even a little bit, with an exact, critical amount of energy supplied by dark matter and dark energy." ..........so based on his eclectic blending of theories about an interpretation of Planck Data, & hypotheses of DM & DE, he's bragging that he's got all the answers concluding that the Universe is infinitely flat, and if you disagree with him you are a "hater", so I guess that makes Einstein one of his "haters", me too I guess, I loath Einstein because he set forth in his General Relativity just the opposite of the funny farm science this guy has come up with.